We recently got called in by a large Church in New York that desperately needed the Church pews and carpets professionally deep cleaned. Everything was in very poor condition due to the fact that they receive a lot of traffic at this location and they have not been cleaned in quite some time. There were multiple tough stains that we had to tackle. Mostly coffee and drink spills and general body oils. After assessing the conditions of the fabric we were working with we recommended our our deep organic shampoo cleaning. Firstly we pretreated all the spots with our green labeled pre-conditioner. This is a vital step in the cleaning process that many companies do not even take. What this does is loosen up all the deeply embedded soil and emulsifies all the dirt and body oil so that it can be extracted from the fabric. 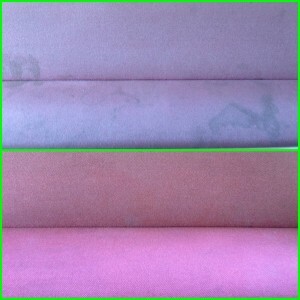 If a company does not pretreat the fabric, often times they are just pushing the dirt and stains deeper into the fabric which means they will pop back up as the upholstery dries. 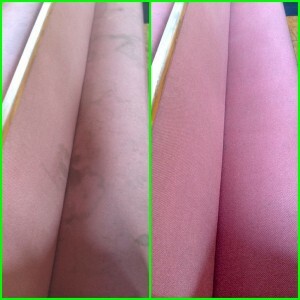 After pretreated, we scrubbed the organic cleaning solution into the fabric to ensure a deep and thorough cleaning. The next step required a bit of patience. We let the solution dwell in the fabric for 15 minutes before we began extracting. The dwell time is crucial because it allows the organic solution to actually do it’s job. Finally we extracted with high pressure water and a rinsing agent that flushed away all the shampoo and extracted all the soil, dirt, grime and drink spills. The pastor was extremely pleased with the end result. He mentioned he forgot what the original color was! It was important to him that we used a 100% organic cleaning process as he is sensitive to harsh chemicals. The fabric was left to dry with air movers so that it would be ready for the service that same day. We are happy to have provided this service for a local Church and after seeing what the dirty water looked like at the end of the job they mentioned they want to do this every 6 months. If you have any questions feel free to call us. We welcome all new customers looking for organic carpet cleaning NYC and no job is too big or small for us too handle. Happy holidays and new year from PureGreen! Organic Deep Cleaning of Church Pews in NYC.